Do you want to make a plan to ensure your wishes are carried out and family protected, or are you comfortable having the government make those decisions for you? More than 60% of married couples have no estate planning at all! That means a court will decide what happens when you pass away or become incapacitated, and the courts will appoint someone to make decisions for you, including selecting the guardian of any minor children. 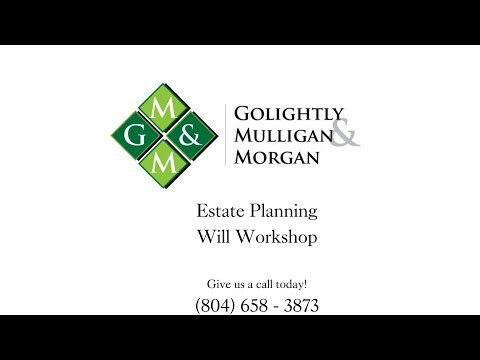 Our Will Workshop will get this plan done for you! Pick the person(s) who will raise your children. Decide how and when your property is distributed. Choose who handles your affairs when you’re gone. Bypass guardian of property for any minor children. Minimize family fights and concerns. Leave a legacy for your Children & Family. right for you and your family? Do either of you have children from a previous marriage? Your situation may require additional planning beyond what the workshop provides and we would like to work with you. Please click here to provide us with your contact information, so we may schedule an initial free consultation phone call. Are your children from your current marriage? Do either of you own any real estate located outside of the Commonwealth of Virginia that you intend to keep long-term?